What do most violinists play as encores? Very often we hear "oldies but goodies" or if there is a more modern piece, it's often in the category of "crossover." But I certainly haven't heard too many pieces that would be considered "contemporary classical" pieces played as encores. Hilary Hahn endeavors to change this by commissioning 27 composers to write short-form pieces for acoustic violin and piano, which she will tour over next two years then record. 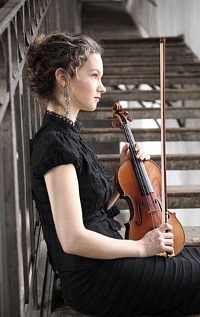 The project is called "In 27 Pieces: The Hilary Hahn Encores." "My initial goal was to expand the encore genre to embrace works of different styles," she said of her project. "Because I was planning to play the commissioned pieces myself, it was important that the composers’ writing spoke to me in some way. I listened to a lot of contemporary classical music, for hours on end, often late into the night. I loved hearing things I had never heard before. I made nerve-wracking 'cold calls' to composers to ask them to participate in my project. I wasn’t sure what the reactions would be, but to my surprise, so many people were receptive that the project gained exhilarating momentum. "It has been thrilling and an honor to get to know these composers as artists and to work with such different personalities and styles. Going into this project, I had no idea how much I would learn from it. Each composer brings his or her own musical language to the table. As a performer, the process of exploring these pieces is both challenging and exciting. The structure may be concise, but each work contains a wealth of expression. "When composers put ideas down on paper, the aural world takes on a greater dimension. My hope is that these particular contributions will showcase the range of music being written today, while bringing enjoyment to listeners and performers alike." A press release says that "A final, 27th composer will be decided in a non-traditional fashion later this year." This is so amazingly cool. I was just reading about a vague project that she was envisioning for this next season featuring contemporary composers, but I didn't know the details. Sounds really interesting. It's really cool, I can't wait! I knew about this but I only heard that she was doing encore pieces by contemporary artists. I didn't expect it to be this conceptual. James Newton Howard (Of The Village fame), Jennifer Higdon, and Edgar Meyer are all people who've made music for her previously. Maybe I'm a bit biased, but my bandmate (in The Dueling Fiddlers), Adam DeGraff's "Sweet Child o' Mine" for solo violin would make a great encore--it's fun, pyrotechnic, popular, and brings a rock edge that we're finding people love to a classical concert. What do you all think? Should Hilary use Adam's "Sweet Child" as one of her encores? What a fun, cool project! I'll definitely purchase it. I'm dying to hear the David Lang piece! Very, very happy to see Auerbach and Rautavaara in there. Looking forward to the pieces. When she records all these I would not be surprised if they go down as legends in musical history! I'm eager to hear what Higdon writes for her. I wonder if Hilary herself is the 27th composer. She has written cadenzas and etudes. Now that would be cool, Christopher! This should be fun. I hope one of these upcoming tours includes a stop near my town, I'd really like to hear these pieces. I wonder if there's any significance to the number 27, other than having 27 encore length pieces averaging about 2 minutes each would fit nicely onto 1 CD. It might be because Hilary's b'day is on the 27th of November. I'm also curious to hear the Mason Bates and the Nico Muhly pieces. I cannot imagine Hilary playing 27 short pieces as a solo concert with piano. But I am very interested in the project! Let`s see how it develops. The alphabetical surname order used in the listing of composers I find disappointing! At least there will be no Bazzini this time! Making cold calls was 'nerve-wracking' for her? I'd be nervous if she called me about writing something for a project! Plus I couldn't imagine someone saying no to Hilary Hahn. I'm familiar with Mason Bates, who had written music for the YouTube Symphony Orchestra. It would be great to hear these pieces played back to back in a recital, but I guess that's unlikely since the project would've instead been labeled 27 'short pieces' rather than 'encores'. Still, one can hope! @alec Her recital program in Seattle a couple years ago featured quite a few pieces which totaled about 25 when counting individual movements so there is precedence! What did it feel like to be in the concert in Seatle? I cannot imagine a concert with so many short pieces having a real identity and/or wholeness. Arabella Steinbacher, like many other violinists, issued an album with encores early on in her career. This new venture of Hilary`s might or might not succeed. In any case , as is already the case, it will create a lot of interest and deserved attention across a wide spectrum of newer music. More than anything else it is the composers who will probably benefit the most this time..and that is definitely something positive in my opinion! @alec The pieces were based on the theme of having some relevancy to local folk tunes of the day, with some Ysaye thrown in. Even so, it was quite a diverse lineup. Yes, it was the Ysaye pieces with the Charles Ives Sonatas 1, 2, and 4 (She and Valentina played the 3rd one as well the year before), the Brahms/Joachim Hungarian Dances and the Bartok/Szekely Romanian Dances. It was structured as a program mostly of music with folk themes and/or dance ones. It was quite possibly the best recital I've ever been to.